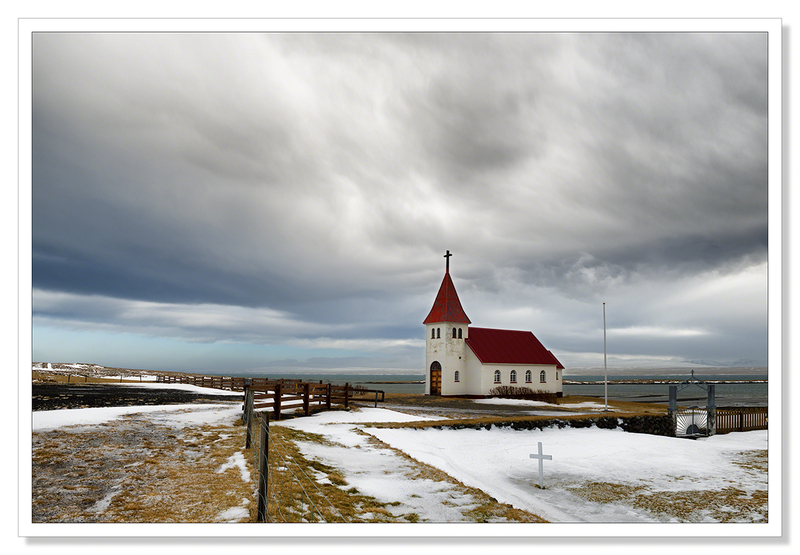 I’m really quite taken with Icelandic churches. The smallest of hamlets will have a church, many created from the same set of architectural drawings it seems. This particular church was on the banks of Miðfjörður in the northwest of Iceland. It had been our plan to tour the Westfjords during our first few days in Iceland but the weather beat us unfortunately. It was touch and go whether we’d make it to the northwest at all following the journey I wrote about in my first post from Iceland which you can see here. Arriving in the northwest we were treated to three days of near hurricane force winds. Gusts of wind were making it impossible to open the door to our cottage and when parking the car, I had to park broadside to the wind so that Chris could get out on the lee side and then turn the car around to allow me to get out. It was crucial to get this right; the best that could happen if you got it wrong was you simply couldn’t open the car door. The worst was a real risk of having the car door ripped from your hands and blown open causing a great deal of damage. This is the most common type of damage that occurs with hire cars in Iceland apparently. For the two nights we stayed in Hvammstangi, a red alert was in force. This meant the wind was gusting at speeds greater than 27 metres per second. That’s a force 11 on the Beaufort scale, a wind that is very difficult to stand up in. The advice from the Icelandic road agency is that when a red alert is in force, driving is hazardous and vehicles of all kinds risk being blown off the road. Thankfully we didn’t get blown off the road but with snow and ice covering the roads, it really didn’t make sense to travel too far afield. These were the conditions we encountered just a few minutes after taking this photograph. You can hear the snow flakes hitting the windscreen they were driven with such force. I had wanted to revisit Arnastapi and Snaefellsness where this picture of another very similar Icelandic church was taken but the sadly the weather was against us.. This entry was posted on March 12, 2015 by Chillbrook. It was filed under Photography, Photography and Travel and was tagged with Adrian Theze, Arnastapi, Church, Cornwall Photographic, Cornwall Photography, Iceland, Landscape, Landscape Photography, Miðfjörður, Photography, Snaefellsness. You certainly had some weather, Adrian! Oh, I must say I’m envious!! Why am I not surprised? Things do come at a cost, but I’m so pleased you found the experience worth it…. Keep resting…. I lost the door of my wife’s grandmother’s Ford Fiesta in high winds in St. Merryn once, so can understand your concern! I was prepared to a certain degree, living in Cornwall and driving to the coast in high winds and parking accordingly but even so, I was shocked at the ferocity of the wind. Amazing photo’s of Iceland and a videoclip of the bad weather. Despite this crazy weather report (wow! 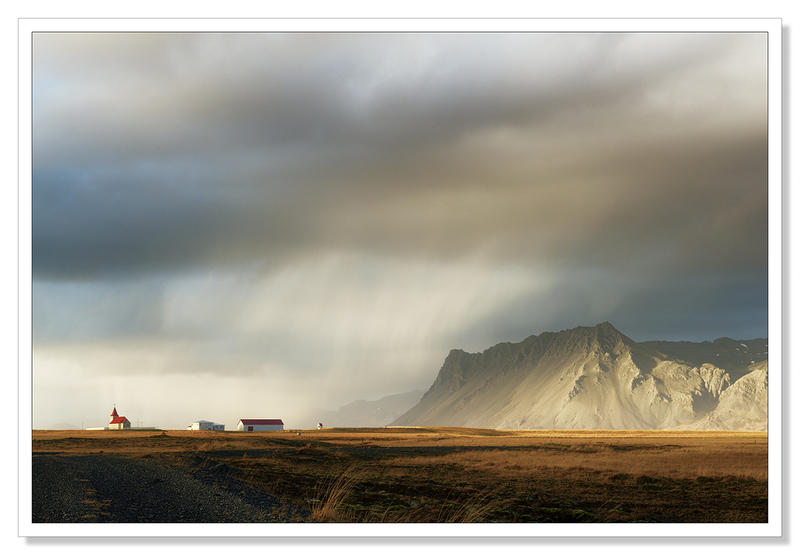 ), Iceland is on my “must go” list— beautiful photos! Wonderful serie! Iceland is great! You are a daredevil Adrian and your testicular fortitude surpasses mine. Great images. These solitary churches are so starkly beautiful – especially the way they’re depicted in your amazing photos and imagine that they can withstand the kinds of winds you’re describing! I was fascinated with the single white cross in the graveyard – was there one lonely grave or don’t they have markers on every one? That video set my teeth on edge – yuk to that weather although we get our share here in winter too. Thank you Carol. There were other graves in the graveyard, I was able to frame the picture to include just this one. I thought it made for an interesting composition. Gorgeous little churches, Adrian. I don’t envy you that wind at all. Every day would be a bad hair day for me. :D When is the best month to visit Iceland, weather-wise? Magnificent skies…..really looks like a most amazing place! It is Therese, thank you! Loved those little churches ! One in particular passed me by I’m not sure how that happened – scrutinising the map – or more likely swigging from my Thermos :-D I’m sure you have it in your collection ChillB . this is very extreme climatic conditions ! I’ve heard about the wind causing damages to rental car, it can happens quite easily I think. You did well taking care while parking. It was extreme but I’m glad I experienced these conditions. It was all new to me. The UK is so temperate in comparison! We were warned when we picked our car up about the wind. As I said in the post, wind causes more damage to hire cars than anything else.. Photos are super, weather is extraordinary! Nice experience! Fantastic. You can see you had to be a viking to live in such a landscape. Absolutely Bente.. I can’t imagine how it must have been to live in this landscape without all the modern comforts! I wonder of those churches were all built during one long construction road trip around Iceland. I didn’t realize They had such strong winds – my goodness! That last photograph, the one of the church at Arnastapi and Snaefellsness, has such a wild look to it. Beautiful! Simply serene and beautiful, Adrian. That single white cross adds the little “extra” as well. Terrible weather – but you seem to enjoy it. Good! Looking forward to more adventures from you! Stunning Adrian especially the second image. That must have been a crazy drive. Oh my, that last shot is so very, very dramatic and gorgeous! The churches remind me a bit of Canada’s Gaspé Peninsula where every little hamlet had it’s church. The churches are a real highlight of Iceland! Wow! Thank you for the video. That little taste of your experience is an inspiration! And of course, the photos are amazing. Wonderful captures! I spent my winter time in the North and East…such light! You have taken me farther. Thank you. It’s a pleasure Harold, thank you for your comment!